Our range of products include microprocessor nephelo turbidity meter s-966 and microprocessor nephelo turbidity meter s-968. 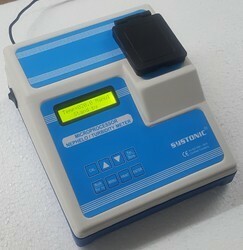 16 Character X 2 Lines Alphanumeric LCD. 30 mm flat bottom Test Tube. Higher durability and long life. 1000 Samples Storage with Date &Time. Dust Cover Model S-966 Turbidity Range 0-1000 NTU Resolution 1 NTU in lowest Range Range Selection Automatic Accuracy +-3%, FS+-1-digit Detector Photodiode Sample System 30 mm Clear Glass test tube Light Source 3.6V/100ma LED Calibration Manual Temperature Range 0C to +100 C Resolution 0.1 C Accuracy +- 0.2 % Input Type Pt 100 Calibration Manual/ Auto Display 16 Character X 2 Lines Alphanumeric LCD Display Format Temp & Turbidity Simultaneously Setting By Soft Touch Keys Storage 1000 Samples With Date &Time PC Interface RS-232 Real Time Display 24 Hour Mode With Date Power Supply 230 V +-10% Ac 50 Hz Dimension 198x238x103mm Weight 2kg. 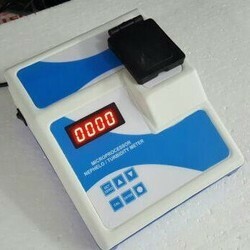 We are leading exporter of Microprocessor Nephelo Turbidity Meter. Errors & Precautions: Start : 1- Connect Adopter connection on rear panel & switch "ON" the Instrument. Adopt the Calibration procedure, only if needed and when You have proper standards . Otherwise the Instrument is Pre-calibrated with default values ( Factory Settings). Turbidity sample test tube must be thoroughly cleaned both Inside and outside. In case the test tube gets scratched or etched discard it. Do not touch the Turbidity test tube where the light strikes.a. at side of test tube. So hold test tube at the top. Please ensure that the mark on the Turbidity test tube Coincides with the mark on the Turbidity sampler & fill the Sampler tube up to the mark given.